The 24-inch AOC e2460Sh display was designed with speed in mind. The ultra-fast 1ms GTG response time makes it perfect for passionate gamers, as well as anyone who uses graphics, animation and film editing applications. Full HD 1920 x 1080 resolution reveals the finest details while impressive 20M:1 dynamic contrast delivers sharp imagery with deep, true blacks. The built-in 2 watt speaks offer rich, clear sound for movies, music or video calls. The stand easily tilts the screen to a comfortable position, or use the VESA mount to hang it on the wall. VGA, DVI and HDMI connectors let you hook up multiple computers, devices and peripherals. Smart energy-saving features like the W-LED backlight have earned this monitor an EPEAT Gold certification. 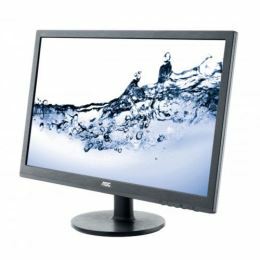 AOC stands behind the quality of each and every monitor with a generous three-year warranty starting from the original date of purchase. Within the warranty period, any AOC displays with manufacturing defects or faulty components will be repaired or replaced at no additional charge. Read the complete AOC warranty statement for more information. Choose the right path to success, don’t let a slow display stop you.